We were lucky to receive a stack of books from Rare Bird Books, a publisher we love. We fell for Inside V by Paula Priamos, who also wrote the memoir The Shyster’s Daughter. So we thought we’d pick her brain about writing, thrillers, memoirs, and how she got published. The Book Doctors: What kind of books did you like to read when you were a kid and why? Paula Priamos: Well before kindergarten I taught myself how to read with the book Black Beauty. I started sounding out the small words first and then I’d read those same basically one syllable words to my mother and I’d fill in the rest, concocting my own story about a runaway horse, a plot that had nothing to do with the words on the page. Oftentimes I grew frustrated that I didn’t understand the bigger words. But my mother would patiently help me sound those words out and eventually I read her the entire book. As I got a little older I gravitated towards Nancy Drew and Hardy Boys mysteries because I loved having to figure things out. TBD: What was the inspiration for Inside V? PP: I always start writing with characters first before conflict and I conceptualized this couple in my head, a man and woman, who are in the kind of relationship that begins with infidelity and quickly winds up in marriage. Yet even with a couple of solid years spent as husband and wife their relationship remains intense – deeply sexually and emotionally connected – and sometimes it’s even dangerous because their passion for each other doesn’t level off or stabilize. They remain in the throes of that initial passion that first brought them together. The threat to their marriage in the form of a seventeen-year-old girl accusing the husband of sexual assault came to me next, and the events and other characters in the book pretty much played out in my head. It felt as if I spent most of the time writing this novel rapidly filling up lined notebooks, then typing it all on the computer, just trying to catch up. TBD: How did you approach writing a novel, as opposed to a memoir? PP: I wrote my memoir with literary elements like a narrative arc, scenes and dialogue, so it wasn’t very hard to segue into a novel. There are some literary people who claim a writer can’t write in more than one genre, but I think that mindset is false and quite limiting. TBD: What was it like to be the daughter of a shyster? PP: I was the only one out of my two siblings who stayed with my father after my parents decided to divorce when I was a young teen. I’m actually proud to be a shyster’s daughter. My father, in his day, before he was disbarred for embezzlement, was a sharp criminal defense attorney. He was a clever showman who rarely needed to rely on notes when he gave closing arguments, and he angered more than one veteran prosecutor when he’d successfully get his clients off. Over the years he’d done some bad things, crossed legal lines he knew he shouldn’t, and essentially became as morally corrupt as the clients he was defending. But that doesn’t mean he didn’t know how to teach me morals. My father taught me how to read people, to question their motives and to stand up for myself when I need to. I know I’m a much stronger woman for having been raised by him. TBD: How do you think growing up in Southern California affected you as a writer? PP: Being a So Cal native is a great thing. I live in an area that is ethnically diverse and with that comes all kinds of intriguing people to write about, conflicts to be had. Geographically Southern California offers mountains, the ocean, deserts and all kinds of city culture, so there are fantastic places to set the backdrop of my scenes. In Inside V, the story takes place in LA, the Valley, Palm Springs, and in Newport Beach. TBD: What draws you to the thriller category? PP: I love thrillers, whether it’s books or films. There is nothing more satisfying than reading or watching a smart and unpredictable whodunit that deals with character and story in equal measure. I wrote my memoir in a way that leaves the death of my father a mystery up until the end of the book, so it only made sense when I decided to write fiction that it be a thriller. TBD: What are you working on next? PP: I’m more than halfway through another thriller, set in the LA area and with another Greek female protagonist. That’s where the similarities end. This protagonist is not as headstrong as “V” nor as confident, but she gains strength in other ways throughout the narrative. The plot is different. She is trying to move on from a failed first marriage, a former husband who isn’t ready to let her go, all while she atgetting publishedtempts to find an old childhood friend who’s suddenly disappeared just hours after they’d been reunited. TBD: How did you go about getting this novel published? PP: I had a disagreement with the literary agent who was going to send this novel out to publishers. This particular agent wanted me to fatten up my lean novel and make it more of a typical “women’s mystery novel,” which I did not want to do. I feel that some of these bulkier books derail the tension lines with unnecessary details and languishing asides. Instead I had a person who’d worked PR for my memoir send it to the publisher at Rare Bird, and, as it turns out, she sent it to the right place. The publisher loved that it was the type of book a reader could finish in one day while curled up on the couch or on a long plane ride. TBD: What advice do you have for writers? PP: I teach creative writing and one of the first things I tell my students is to be both humble and confident. Know that you’re not immune to criticism and helpful suggestions, but also know that you can’t please everyone nor should you try. Keep an open mind without losing your own creative vision. Try not to get frustrated with what may seem like a slow process of seeing your work to publication because, in the end, there’s nothing like the rush of holding your own beautifully bound book for the first time and knowing it now has the potential to reach countless readers. 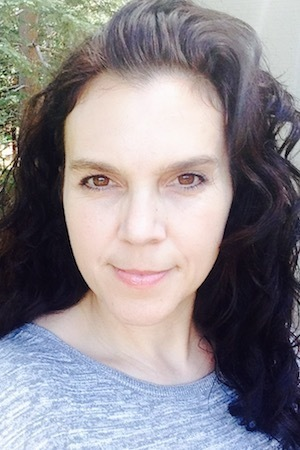 Paula Priamos’ writing has appeared in The Los Angeles Times Magazine, The New York Times Magazine, ZYZZYVA, Crimewave Magazine in the UK, The Washington Post Magazine, and The San Francisco Chronicle, among others. She is the author of the memoir The Shyster’s Daughter and teaches English and creative writing at CSU San Bernardino. Visit her at paulapriamos.com.